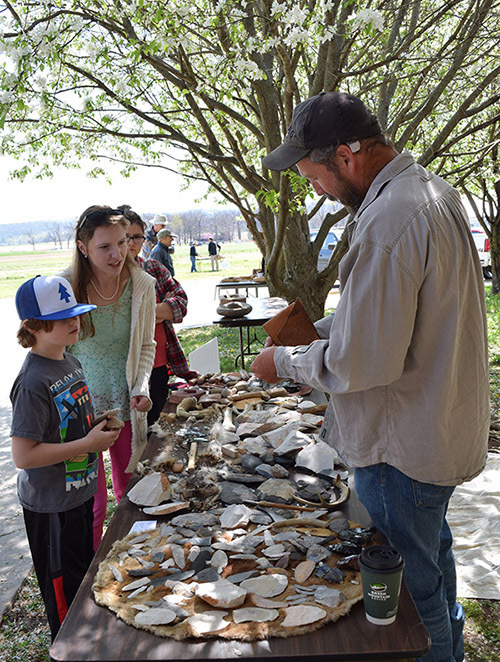 UAF Station Assistant Mike Evans demonstrating flint knapping during Archeology Day 2016 in Fayetteville. Many states in this country designate one month out of the year as Archeology Month. Arkansas is no exception. In April 1991, a collaborative effort began between the Arkansas Archeological Survey and the Arkansas Archeological Society to conduct an Archeology Week in Arkansas. The week-long event was held each year until 2002, when Archeology Week became Archeology Month. We decided to expand to a month in order to allow more flexibility for scheduling the many events taking place across the state. At that time, many other states had made the same move. After a couple of changes to the designation of which month would be Archeology Month, we settled on March. Now, there is often an official proclamation by the Governor of Arkansas creating March as Arkansas Archeology Month. The Arkansas Archeological Society produces a poster and the Arkansas Archeological Survey prints a program pamphlet every year to promote activities all around the state. Mailing costs are borne equally between the two organizations. There have been many themes for Archeology Month over the years. Some examples include “Picture the Past,” “Tools of the Trade,” “A Necessity of Life: Shelter, Food, and Clothing” (three years), “Archeological Parks,” “Containers Before Plastic,” “Partners of the Past,” and “Archeology of Conflict.” As of 2013, the theme each year is “Celebrate Archeology,” allowing flexibility in programming and sometimes an opportunity to align with other annual celebrations or ongoing projects. ASU station archeologist Dr. Juliet Morrow identifies artifacts at Parkin Archeological State Park. Various entities, including Society Chapters, Survey Research Stations, historical societies, libraries, museums, education centers, universities, state parks, and even the University of Arkansas Press pool their resources and plan special events all throughout the month. There are special museum exhibits and discounted admission pricing, night talks, day talks, tours, classes, hikes, workshops, digs, open houses, fairs, and other activities with new things added every year. 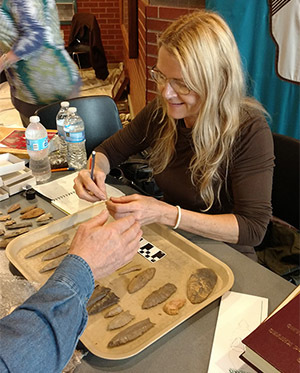 Annual favorites include ArchaeOlympics, artifact ID days, and an open house at the Arkansas Archeological Survey Coordinating Office and the University Museum Collections. Archeology Month is one of the major outreach activities of the Arkansas Archeological Survey and the Arkansas Archeological Society that make people aware of the fact that Arkansas has a lot of history and that amazing things happened right in our own backyard. Archeologists and historians don’t have to travel to far off exotic places to study ancient cultures, we have that right here, 14,000 years’ worth. Of course, most archeologists celebrate archeology every day, but in March, we hope all of the citizens in Arkansas celebrate archeology as well. Read more about Archeology Month! 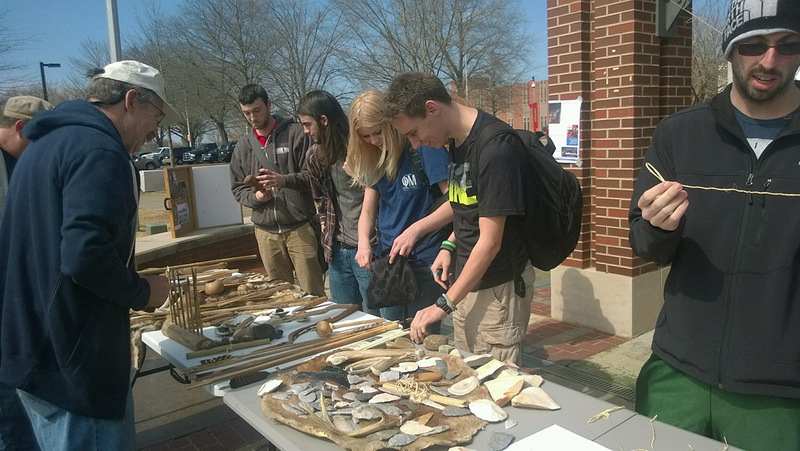 Arkansas Tech University students examine artifact replicas at Archeology Day 2016 in Russellville. The event was hosted by ARAS-WRI station archeologist Dr. Emily Beahm and the Arkansas Tech Anthropology Club.